It is the first Monday of that time of year that depresses me–when the sun fades long before the workday is over. It’s also a nasty day out–actually some snow falling this morning along with whipping wind and rains…so I awake searching for a little inspiration. 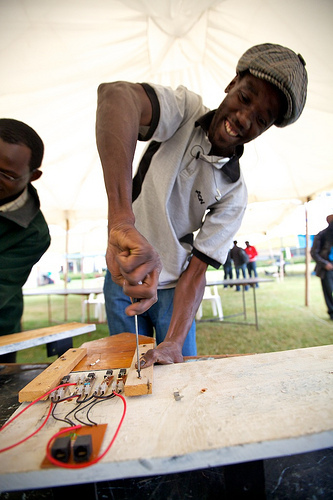 AfriGadget is a website that collects photos, videos, and stories from amazing innovators. Project creators submit their own content from across Africa, demonstrating ingenuity with severely limited resources. It is, correctly described on the site, “a testament to Africans bending the little they have to their will, using creativity to overcome life’s challenges.” I find it truly inspiring to search through the website and find things like a false tooth press made from recycled random tool parts that is making reparative dentistry possible…household solar water disinfection systems from discarded water bottles…a customized bicycle that recharges the rider’s cell phone while pedaling…used tractor tires re-purposed and reformed into water buckets and animal feeding troughs…tin can, wires, and bulb emergency lantern…brightly colored toys made from trash-picked remnants…and so much more that makes me question just about everything I’ve dropped into the trash can every day of my life.